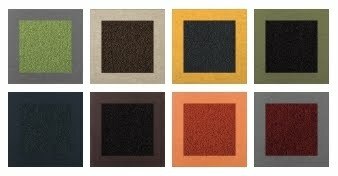 I love FLOR carpet tiles, but I have yet to make the leap and order samples, much less an entire rooms worth of tiles. I just can't decide which style I like best, which arrangement to go for, yada, yada, yada. Plus, when their catalog comes in the mail, I die over all THEIR designs and get overwhelmed with what to do with MY space. One day...one day, I will figure it out. But today, their newest style, "Haute Stuff," has me giddy. It's SO FUN...behold: and it comes in all these fun colors: This one is particularly happy, but I don't have a use for orange in my house. YET. Perhaps my love for FLOR was inspired by my love for David Bromstad. I watched back-to-back-to-back-to-back-to-back episodes of Color Splash: Miami last night since I had DVR'ed them all but hadn't yet watched them. OH. I was dying. He seriously can do no wrong and is my absolute favorite HGTV designer, hands down. 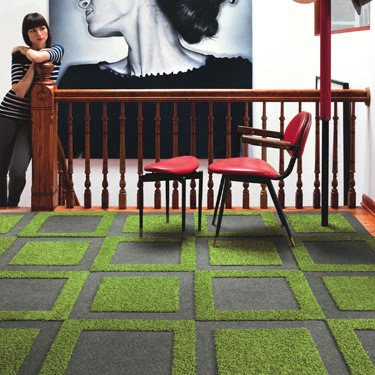 I've got rugs on the brain here lately so I just had to share FLOR's newest addition.